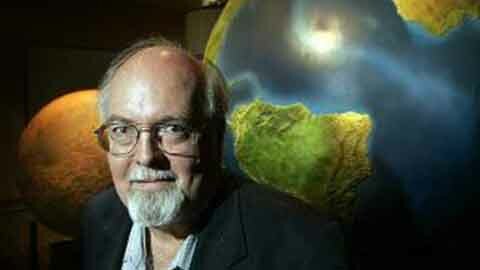 Dr. Clark R. Chapman is Senior Scientist in Southwest Research Institute’s Boulder, Colorado, Dept. of Space Studies (Dept. of Space Studies of SwRI’s Division 15). He is also an Adjunct Professor in the APS Dept. at the University of Colorado (Boulder). Until March 1996, he was Senior Scientist at the Planetary Science Institute in Tucson, Arizona. Until 1999, he also remained as a Consulting Employee for Science Applications International Corporation, which he joined in 1972. In the early 90s, he was the first Editor ofJournal of Geophysical Research–Planets. For many years, he was a member of the Imaging Team of the Galileo mission to Jupiter. Dr. Chapman was also a member of the MSI/NIS (imaging/spectrometer) Team of the Near Earth Asteroid Rendezvous (NEAR Shoemaker) mission to Eros, which was launched in February 1996, went into orbit around Eros on Valentine’s Day, 2000, and successfully landed on the surface of Eros on Feb. 12, 2001. As a member of the Science Team of the MESSENGER mission to Mercury, Chapman has been studying images and other data returned from the spacecraft’s first flybys of Mercury and from its primary and extended orbital missions around the planet; he is Education Public Outreach liaison with the Science Team and, as a member of the Geology Discipline Group of the Science Team, he is helping to conduct searches for satellites of Mercury and putative vulcanoids, as well as concentrating on studies of Mercury’s craters and geological processes and history. Dr. Chapman is a past Chairman of the Division for Planetary Sciences of the American Astronomical Society and past President of Commission 15 (Physical Properties of Asteroids and Comets) of the International Astronomical Union (IAU). He served two terms on the Council of the Meteoritical Society. Dr. Chapman received an undergraduate degree in Astronomy from Harvard, Master’s Degree in Meteorology from M.I.T., and PhD in Planetary Science from M.I.T. (1972). He is a leading researcher in planetary cratering and in the physical properties of the smaller bodies of the solar system (asteroids, comets, planetary satellites, the planet Mercury). He led the Galileo imaging investigations of Ida(resulting in the discovery of Dactyl, the first known satellite of an asteroid) and of the impact of Comet Shoemaker-Levy 9 into Jupiter. Drs. Chapman and Bill Merline served as advisors to PhD candidate Beau Bierhaus, Univ. of Colorado, who received his degree in 2004. They continued to study the Galilean satellites Europa, Ganymede, and Callisto, especially secondary/primary cratering of the exceptionally young terrain on Europa (their paper appeared in the 20 Oct. 2005 issue of Nature). Dr. Chapman has been the Principal Investigator of many NASA and NSF grants and has been P.I. of research concerning the Late Heavy Bombardment of the Moon (and inner solar system), astronomical observations of very young asteroid families, analysis of NEAR Shoemaker images of Eros, studies of secondary cratering on Mars, and investigations of the cratering records of the Galilean satellites. He has frequently been an advisory consultant for NASA and he chaired NASA’s Planetary Astronomy Management Operations Working Group. He was a member of the prestigious COMPLEX committee of the National Research Council (NRC). In 1997/8, he served on the NRC’s Task Group on Sample Return from Small Solar System Bodies and more recently (2009) on the Mitigation Panel of the Congressionally mandated NRC study of the NEO hazard. Most recently, Dr. Chapman served on the Task Force on Planetary Defense of the NASA Advisory Council. Asteroid 2409 Chapman bears his name. Dr. Chapman is author or co-author of innumerable technical papers dealing with practically every planet in the solar system. He was Co-Editor of “Mercury,” the definitive book on the planet Mercury published by the University of Arizona Press (1988); as a member of the MESSENGER Science Team, he has special liaison responsibilities between that team and the project’s Education and Public Outreach (EPO) efforts. He wrote the article on “Mercury” in the 2008 edition of the on-line Encyclopedia Britannica. He is author or co-author of several popular-level books, including “Planets of Rock and Ice” (Scribner’s 1983) and “Cosmic Catastrophes” (Plenum Press, 1989). He also wrote a so-far-unpublished book manuscript, commissioned by NASA, on Voyager’s encounter with Neptune. For nearly two decades, Dr. Chapman was the columnist for The Planetary Report, the publication of The Planetary Society; his column was suspended in late 1999. He has written many articles for such widely read science magazines as Scientific American, Pacific Discovery, Astronomy, Discover, New Scientist, and Sky & Telescope. An interview with Dr. Chapman appeared in the March 2006 issue of Discover. He has often contributed technical commentaries to the News & Views columns of Nature, most recently in the 21 January 2010 issue. During the last decade, Dr. Chapman has been prominent in the newly popular subject of the hazard of asteroids and comets striking our own planet. He was a member of the original Spacewatch Workshop held in 1981 (Snowmass, Colorado, chaired by the late Gene Shoemaker) and his book “Cosmic Catastrophes” (co-authored with David Morrison) was instrumental in calling attention to the potential hazard. Dr. Chapman chaired the 1991 International Conference on Near-Earth Asteroids. He was also a member of both of the Congressionally-mandated NASA Committees (on Detection and on Interception of Near Earth Objects) and served as consultant to NASA’s Shoemaker Committee, mandated by Congress following the Shoemaker-Levy 9 comet crash. Dr. Chapman also served on the Organizing Committee of a United Nations meeting on the impact hazard and subsequent workshops, including the March 2001 workshop on Earth-threatening asteroids and comets (part of the 6th International Space Cooperation Workshop). He also played instrumental roles in more recent meetings, including the OECD Workshop in Frascati, Italy, in early 2003; the Planetary Defense Conferences in Orange County, Calif., in 2004, at George Washington Univ. in March 2007, in Granada, Spain in April 2009, in Flagstaff AZ in April 2013, in Frascati (Italy) in April 2015, and the forthcoming PDC in Tokyo in May 2017; and the ICSU Workshop in Tenerife in Nov./Dec. 2004. He was a member of the Organizing Committee of the IAU Working Group on NEOs. Dr. Chapman participated in the Geological Society of America’s project on “Prediction in the Earth Sciences: Use and Misuse in Policy Making.” He also served as Curator of an exhibit at the University of Colorado Museum, concerning meteorites and asteroids, which ran through October 1999. On May 21, 1998, Dr. Chapman presented invited testimony about the impact hazard before the House Subcommittee on Space and Aeronautics. He co-authored a widely-cited 2001 white paper on the impact hazard. Dr. Chapman is a member of the Board of the B612 Foundation , which is working to mount the first-ever privately funded deep space mission, called “Sentinel”, to discover 90% of near-Earth objects >140 meters in diameter. In 1999, Dr. Chapman updated his research on the impact of Comet Shoemaker-Levy 9 into Jupiter. He designed the S-L 9 observational program of the Galileo spacecraft, used telescopes of the Kitt Peak National Observatory, and wrote some widely-read popular and technical review articles about S-L 9 for Sky & Telescope, Nature, New Scientist and two Cambridge University Press books on the comet crash. Dr. Chapman’s thematic article on asteroids, the comet crash, and related topics was published in the 1996 Encyclopedia Britannica Yearbook “Science and the Future”. In 2006, Dr. Chapman contributed articles about Pluto and other would-be planets to the Encyclopedia Britannica and Compton’s Encyclopedia. More recently he has contributed to Macmillan encyclopedias. Dr. Chapman’s other current research activities include searching for asteroid satellites utilizing adaptive optics techniques on large groundbased telescopes (a program led by Dr. Bill Merline) and studying the interrelationships of asteroids, comets, meteoroids, interplanetary dust, and meteorites. His invited review paper for Meteoritics and Planetary Science entitled “S-type Asteroids, Ordinary Chondrites, and Space Weathering: The Evidence from Galileo’s Fly-bys of Gaspra and Ida”, Nov. 1996, provides a thorough background to NEAR’s subsequent investigations of Eros. Dr. Chapman’s account of the history of cratering impacts on Eros was published in a 2002 Cambridge University Press book for lay audiences, “Asteroid Rendezvous: NEAR Shoemaker’s Adventures at Eros” (edited by Jim Bell and Jacqueline Mitton). In October 1999 in Padua, Italy, Dr. Chapman received the 1999 Carl Sagan Medal for Excellence in Public Communication of Planetary Science (awarded by the Division for Planetary Science of the American Astronomical Society). He was also elected a Fellow of the American Association for the Advancement of Science and received his certificate and rosette from the AAAS President, the late Stephen Jay Gould, at the Feb. 2000 Washington D.C. meeting. More recently, an essay by Chapman and Alan Harris in the Sept./Oct. 2002 issue of “The Skeptical Inquirer,” “A Skeptical Look at September 11th”was selected by Richard Dawkins as one of the best science/nature essays of the year and was published in late 2003 in a compendium by Houghton-Mifflin; it was republished again in 2009 in a collection of S.I. articles ed. K. Frazier, Prometheus Books). Chapman and Harris published a ten-year follow-up of the article in S.I. in 2012. Dr. Chapman has frequently lectured to public groups (e.g. at science museums or in public lecture series) about planetary science. In 1995 he was a featured evening lecturer at the Hayden Planetarium of the American Museum of Natural History; on Feb. 28th, 2000, Dr. Chapman presented his Sagan Medallist talk on the subject of Europa at the new Hayden Planetarium, one week after the official opening of the reconstructed Rose Center. In early 1998, he lectured on the subject of “oceans” to Jason Project school teachers at the Denver Museum of Science and Nature. In spring 1998 in Las Vegas he addressed the National Science Teachers Association on the subject of the impact hazard and has since talked on the same subject at Illinois State University, Dartmouth College, the University of Northern Colorado, the Univ. of Colorado Sigma Xi, the annual meeting of space weather researchers, at a NASA Ames symposium on “Space Science, Environmental Ethics, and Policy,” at the CosmoCaixa science museum of Barcelona, and at an Astrobiology Workshop at the SETI Institute in February 2009, among other venues. He talked with elementary school children in New Orleans and later with astronomy afficianados as part of an astronomy weekend in Rocky Mountain National Park, sponsored by the Denver Museum of Nature and Science. Dr. Chapman continues to give public talks, such as an April 2013 lecture to geology and astronomy clubs in the Chapel Hill/Raleigh/Durham vicinity. Dr. Chapman has appeared in local, national, and international radio, TV, and Internet programs; for example, he has been on the Jim Lehrer News Hour (PBS), National Public Radio’s “All Things Considered” and “Morning Edition”, the CBS Evening News, ABC World News Tonight, and the “Ann Online” Internet talk show. He was featured in an episode of PBS’s “Futurequest,” in a sober segment of “Sightings,” and in the March 1997 Fox documentary, “Doomsday”, as well as on several Discovery Channel documentaries. Other educational outreach activities included working with WGBH on an often-rebroadcast episode for “Nova” concerning the impact hazard, shown on PBS numerous times during the decade following its first broadcast in Oct. 1995, and serving as an on-line expert concerning Europa on the Discovery Channel website in April 1997. During early 2006, he appeared on documentaries broadcast on “The History Channel,” on “The Science Fiction Channel,” and on ABC’s “20-20.” Since 1990, Dr. Chapman has also been interviewed by Japanese television, the BBC, the National Film Board of Canada, Austrian National Television, the Canadian Broadcasting Corp., Italian television, and several syndicated radio shows. In February 2001, he provided live narration on CNN and CNN International of the images of Eros as NEAR descended toward its historic landing. Dr. Chapman has also been quoted extensively in The New York Times, Boston Globe, International Herald-Tribune, The New Yorker, The Baltimore Sun, Science News, Popular Science, space.com, USA Today, Technology Review, Time, Newsweek, and by various wire services. In early 2003, Dr. Chapman participated in an on-line “Great Debate”, sponsored by NASA and Astrobiology Magazine, concerning the impact hazard. Dr. Chapman is featured in an interview in the March 2006 issue of Discover magazine. During the first half of 2009 alone, Dr. Chapman has been interviewed for 4 TV documentaries on the planet Mercury, Jupiter’s moon Callisto, and the asteroid impact hazard. Most recently, he appeared (in 2012 and 2013) on a Weather Channel documentary. Dr. Chapman lives with his wife, Y, at Rancho Europa, named for the moon of Jupiter. Their home is located on ten acres in the foothills of the Rockies southwest of Boulder at an elevation of 8,150 feet. When at home, Dr. Chapman accesses the world through the wireless broadband service of Magnolia Road Internet Cooperative. His daughter Ginette married Mitch Tobin in a wonderful event (Tucson, April 2006); they moved to Denver in late 2008 and have a daughter born in May 2014. His sister lives in North Carolina, and his brother lives in Maine. His mother passed away in late 2014 at the age of 101. His father, Seville Chapman, died one-quarter century to the day before the 9/11 terrorist attacks; his work on researching and teaching physics and making it relevant to ordinary people lives on in the age of the internet.